Pomoca is a Swiss climbing skin specialist that has definitely nailed its specialty. Though it's hard to say for sure what makes the skins perform so well, since the exact formula they use is a trade secret. We do know they climb and glide with aplomb. Pomoca is only contented by having the fastest skins on the market. The Race Pro 2.0 formula has been competition and lab tested for several years with the singular goal of maximizing glide. 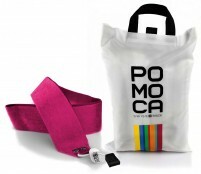 This is the skin that Kilian Jornet has been winning race after ..
Pomoca’s race formula with a twist. The Race Pro Grip is designed to be the secret weapon when the skin track freezes over and everybody starts to slip, or when the slope angle increases beyond all reason. Pomoca usually reserves their famous Grip treatme..
Race skins for wide skis! The Pomoca Race Back Fix is the easiest way to apply the buttery glide of your race skins to bigger planks. Ideal for clocking the fastest powder laps and skiing objectives when time is crucial, but you still prefer to bring your..
Also known as the Pomoca Climb Pro, these 100% mohair skins give you natural glide. However unlike untreated mohair that can get waterlogged, the Pomocas feature an EverDry treatment that helps prevent glomming and a waterproof membrane to keep moisture o..
We’re not sure but we think the “S” stands for “Super”. The new Pomoca Super treatment on the old reliable Climb Pro Glide skins makes them even better at sliding. The friction coefficient is now more akin to racing formulas than to similar mohair-mix ski.. The S-Glide skins have very little room to improve. Pomoca is trying to one-up themselves anyway. 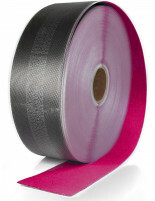 The Tipon formula has a thinner backing material and an innovative “non-glue” adhesive. The result is a skin that is lighter, much more packable, and easy to.. The Pomoca Climb 2.0 formula focuses on savings, both weight and cash. As of this writing, they are the lightest available trim-to-fit climbing skins for skis. Pomoca uses a short nap on its Safer Skin Light backing, making for an extremely lightweight an..
Of course the fastest skins in town are available on the roll. Get the new Super Glidey race formula from Pomoca in exactly the length you want. Then attach your favorite tip system, round the tails, and go race. Or train, tour, explore, whatever. The Rac..
Race material wide enough for your pow planks! Since more surface area means more friction while skinning, fatter skis should have faster skins. The Pomoca Race formula has been vying for the title of “fastest skin on earth”, and now it’s available for li.. This is the Race Pro Grip skin off the roll. Buy just the amount of grippy goodness you need. Pomoca made this formula to ensure you have the most grip on icy courses. It’s also great for folks getting started with racing that are still working on their t.. Finally, Pomoca mo-mix off the roll! Pomoca’s Climb Pro S-Glide has become a favorite among the ski tourers that like to ski a little bit of this, that, and the other because they do well in every type of condition that includes snow. A 70% mohair, 30% ny..
Less slippery than its banana-peel yellow appearance, the Pomoca Climb 2.0 skin material is a solid choice in all conditions. It’s particularly noted for its packability and light weight. We have found this material ideal for expedition use and situations.. The Pomoca Top Fix RACE attachments consist of a highly elastic 3.5mm traction cord, an eliptical ring with excentric holes, and a plastic end cap. These weigh 9 grams per tip including two rivets and the adjustable plastic end grip (which is now white, n..
​The knees to your bees, the carrots to your peas, or the pajamas that your cat wears for some reason. The Pomoca Back Fix Easy is the complete top-to-bottom kit designed to get your climbing skins off the roll and onto the mountain. Included is a simple ..
Pomoca skin attachments are available separately for your skin fixing pleasure. All parts are sold in pairs. Clock Lock Tips - Swappable tip attachment system that is screwed on to your skin and allows interchange of various sizes of bent buckles. Come.. While this cutter is about 5 times more expensive than the letter-opener variety, it makes trimming skins about 100 times easier. If you value your time and the quality of your cut, the math works out in your favor. Stick your untrimmed skins on your skis.. Pre-schoolers tend to possess better arts and crafts skills than the average adult and would make light work of cutting a perfectly rounded tip or tail on a climbing skin. Unfortunately for most of us, we don’t always have a state-of-the-art pre-schooler ..
Pomoca’s BiColor Wax is the Neapolitan ice cream and Swiss army knife of the climbing skin world. Each flavor has its own color-coded personality and is ready to give you a leg up on the competition no matter the conditions. Use the included scraper to cl.. Similar to a power meter on a bicycle’s crank arm or a foot pod on a running shoe, the Pomocup lets you measure your skimo effort. Capturing a mind-boggling 1200 data points every second, the Pomocup can be used with or without a smartphone or compatible ..